Cherry Hill Police Sgt. Keath Mahan helps a cadet properly salute Tuesday, Aug. 7, during the department’s Junior Police Academy. 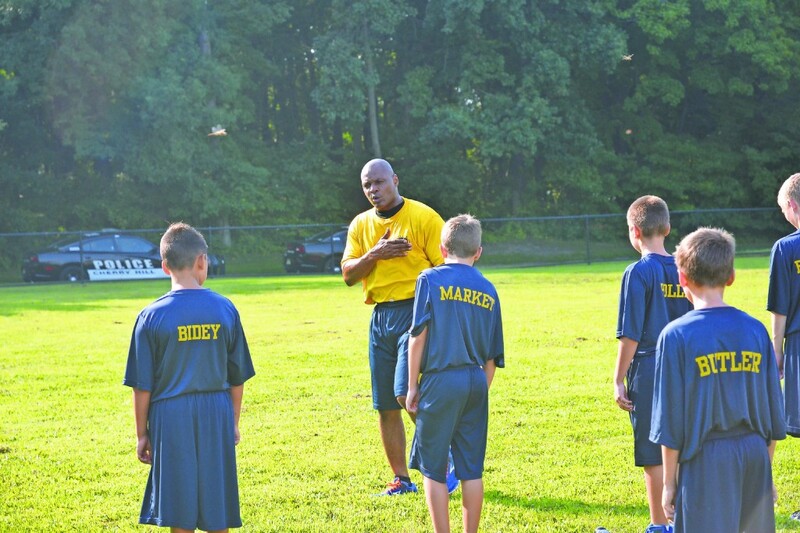 There was not a lot of down time this week for the 40 kids who participated in the Cherry Hill Police Department’s Junior Police Academy. Within the span of five days, the cadets, all between the ages of 11 and 14, learned about police work, got certified in CPR, were taught how to put out a fire, toured a juvenile detention facility and participated in physical training, among other activities. One of the program’s goals is to improve the self-confidence of the kids and help them become better citizens. “By the end of this week, these kids have a sense of pride in themselves and also in their place in the community,” said Rabbi Larry Sernovitz, a police department chaplain who helped with the academy. “It allows them to forge relationships with the officers, which I find incredibly valuable,” he added. 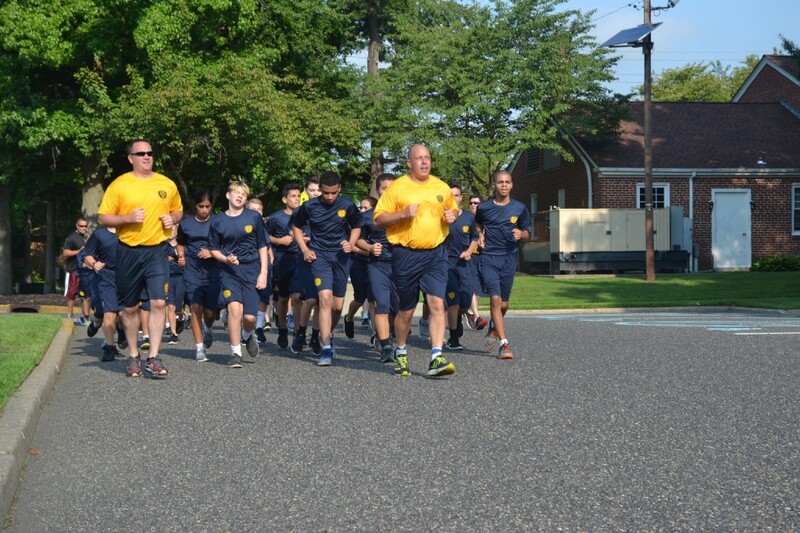 Cherry Hill police officers and cadets run Tuesday, Aug. 7, during the department’s Junior Police Academy. Cadet Jordan Marrero, 11, said he is interested in a career in public safety and likes the teamwork aspect of being a police officer. “It’s really fun, and they encourage you to do work and make you think you can do anything you want,” said Marrero, a student at John A. Carusi Middle School. It’s the fourth year the police department has held the Junior Police Academy, and the program fills up quickly every year, Winters said. Kids who have participated in previous years were not allowed to sign up unless there were open spots after June 1 — which there were not. “What we’re hoping to do is have an advanced academy maybe next year for kids that have completed the first one and then just take it a step further,” Winters said. Winters said one of the more enlightening parts of the program for the cadets is touring the Camden County Juvenile Detention Center in Blackwood. The police department wants the kids to see what it’s like to be in a detention facility, she explained. Cherry Hill Police Sgt. 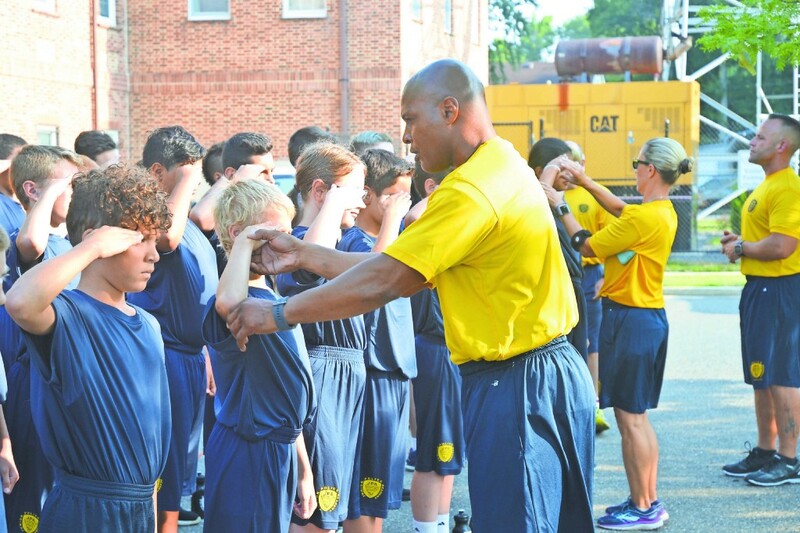 Keath Mahan speaks to cadets Tuesday, Aug. 7, during the department’s Junior Police Academy. In addition, the cadets also took a trip to the Cherry Hill Fire Department’s headquarters, where they were taught CPR and had the opportunity to extinguish a simulated fire. Other aspects of the weeklong program included a K-9 demonstration, a mock crime scene investigation, a presentation from the police department’s tactical response team, a building clearing exercise and a lecture from a civilian crime scene analyst, according to Winters. “It’s not what the kids expect when they go to camp,” she added.